Before I get back to developments on stocks I’ve already covered, I want to highlight another company that trades at a discount to net current assets: Information Analysis, Inc. Many companies and government agencies still depend on software systems and programs created decades ago, written in programming languages that are no longer used. Enabling newer software and hardware to “talk” to these legacy systems involves additional time and expense for IT staff and developers. At some point these costs become unmanageable and it’s time to replace legacy systems or at least develop workarounds. That’s where companies like Information Analysis, Inc. (or “IAI”) come in. Information Analysis’s staff specializes in modernizing obsolete software systems and transferring processes away from retired software. IAI also creates web-based programs that can replace PC-based software. IAI’s largest client is the US Government, which accounted for 87% of revenues in 2012. Such a concentrated revenue base is a large risk. The company notes that contracts made with the US Government are generally less profitable than contracts with private industry, and contain many provisions for cancellation or changes. 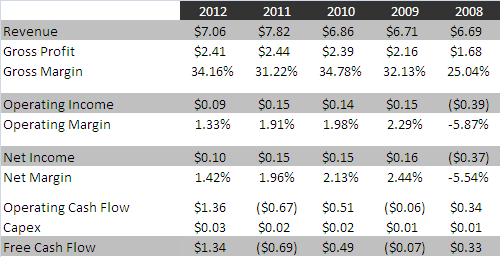 Information Analysis, Inc. has been profitable in 8 of the last 10 fiscal years, and free cash flow positive in 7 of those years. Revenues have trended downward since 2005, but have been relatively stable since 2008. The Fiscal Cliff and a failed sales initiative. These may be temporary issues, but Information Analysis, Inc.’s high operating costs still leave it perilously close to break-even. Declining margins and dependence on government revenues may paint a bleak picture, but IAI’s real value is in its balance sheet. The company is simply loaded with cash. Cash makes up 72.8% of total assets and is 53% greater than the company’s market capitalization. IAI carries very little in the way of fixed assets and has no long-term liabilities. Information Analysis, Inc. has net current assets per share of 18.7 cents. 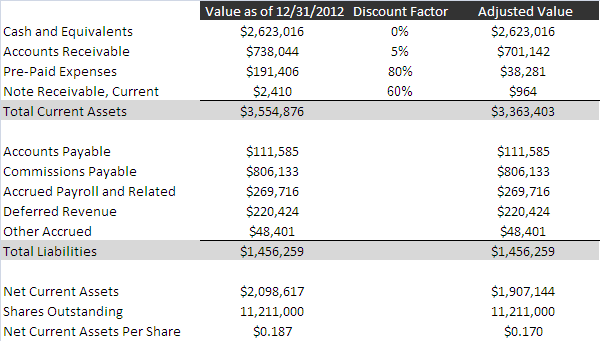 On a discounted basis, net current assets stand at 17 cents per share. (I used a very low discount for IAI’s receivables because they are nearly all government obligations.) IAI’s current share price mid-point of $0.1525 represents a discount of 10-19% from the value of its net current assets. IAI’s large cash balance is both an opportunity and a risk. Insiders own 25.7% of shares, so presumably they are interested in using this cash productively and increasing their own wealth. Whether or not they invest this cash wisely will determine the company’s future and the returns investors will experience. Like most businesses that trade below the value of their current assets, IAI faces its share of obstacles and risks. However, like JLM Couture, Information Analysis could make a solid addition to a diversified basket of stocks trading below their NCAV values. I own shares in Information Analysis, Inc. I wish I knew a secret, but the fact is I simply scour filings as they come in and build spreadsheets. I know of several others I may write up at some point, but business quality falls off rapidly with those. Neat find. My concern is how they’ll deploy that cash. I don’t think they’ve returned any in the past 5 years. What really disgusts me is their statement in the 10-K, “In any event, IAI will be more aggressive than in the past and will take more risks in terms of investment in business development, exploring the potential of diversified business opportunities, and seeking targets of acquisition. We expect to see the results of these efforts during 2013 and beyond.” They’ve spent 3 years now vetting potential opportunities and, given the lack of good acquisition targets in the space (and, both because of the tech-nature and owner-operator nature of their likely targets), this seems to imply they’re lowering their criteria or otherwise looking in the completely wrong direction. It would make a lot more sense for them to just go private. I don’t really think management cares about the share price since, with a market cap of >$2m, I am going to guess they derive substantially more income per annum than they hold in stock anyways. The industry itself is actually pretty decent, though I’m not sure a small company like this is best-placed to take advantage of industry tailwinds. If perfectly executed however this business can do amazing things, but this hasn’t been the case in the past and there’s no reason they’re about to start now. You’re exactly right, and that’s the trouble with these low-quality net-nets. You can never tell which will get smart and return capital or turn their operations around, and which will wither away to nothing. Management does not seem especially concerned with outside shareholders.